I’ve admired David LaRochelle’s books for many years, ever since reading The Best Pet of All, a clever twist on the kid-wants-dog tale. Then there’s It’s a Tiger!, which has to be one of the best read-alouds of all time. (Really. Check it out.) So I’m thrilled that David agreed to visit us here at PBB to chat about his latest book (giveaway details below)—and lots of other good stuff. In This is NOT a Cat! (Sterling, 2016, illustrated by Mike Wohnoutka), a teacher instructs her students (all mice) on a very important lesson: how to recognize danger. But as she introduces various images, repeating “This is not a cat,” guess what sneaks in through the classroom window? Yep, a CAT! By the way, the entire story is told using only the words in the title. That’s right, just those five words. Plus plenty of action and a few surprises at the end. Tell us about your inspiration for this story. I love puzzles. For my book The End, I tried to tell a story backwards, and for 1 + 1 = 5, I wanted to make a book using seemingly impossible equations. For this book I gave myself the puzzle of writing a story that uses only the words in the title to tell the entire tale. I wanted those words to be very simple, so that any beginning reader who could read the title, could read the whole book. 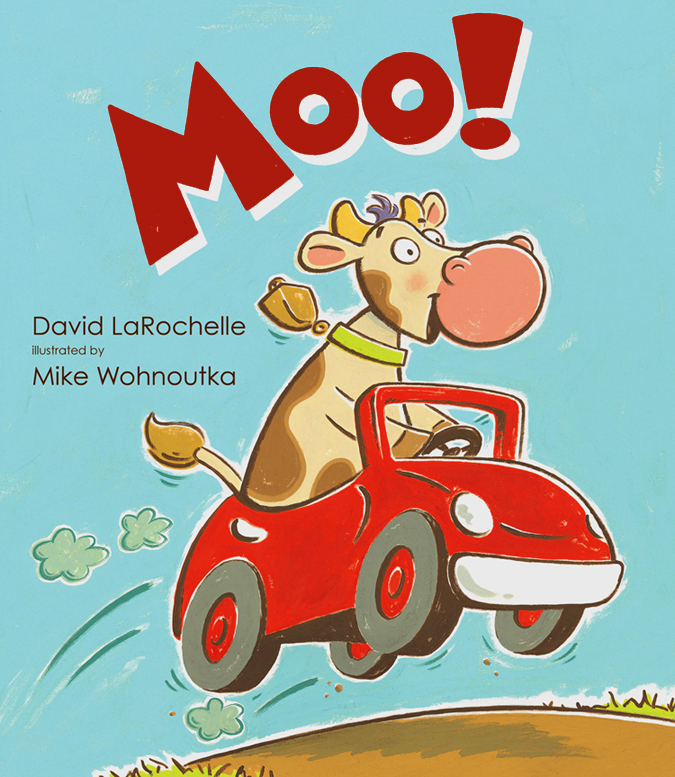 Like Cat, your book Moo!—the story of a cow’s joy ride gone bad—also uses few words. The entire text consists of variations on a single word—Moo—until the final page when the cow blames the wreckage from his misadventure on an innocent sheep (Baaaaa!). Based on a true story? More so than you might think! Many years ago my friend Gary gave me a cylindrical cow noisemaker for Christmas, which I named Bossy. It wasn’t long before I began making up adventures for this cow (along with her best friend Daisy). These adventures frequently involved unwise decisions on the part of Bossy (trying to make popcorn balls, staying out all night at the mall, testing a hang glider, etc.). 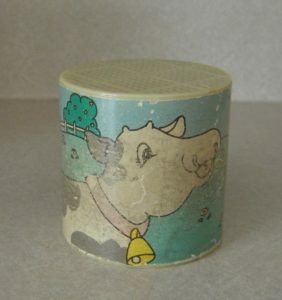 When I decided to write a book using only one word, Moo seemed like a good choice, and I already had lots of experience inventing exploits for a mischievous cow. If you check the front of the book, you will see that it is dedicated to Bossy and Daisy. I knew they would never let me hear the end of it if they didn’t get significant recognition! Given that both books use so few words and are told largely through the illustrations, what did your manuscripts look like when you submitted them? In both cases I had originally intended to be the illustrator as well as the author. I created complete black and white dummies for each book. However, by the time I submitted the stories to editors, I was thinking that my friend Mike Wohnoutka might be a better illustrator for the books than myself, and in the case of Moo!, I sent a sample of Mike’s artwork along with my dummy. Even though editors usually frown on authors suggesting their friends as illustrators, in both cases the editors agreed that Mike was the right choice…and I’m so glad they did! I know Mike did a better job illustrating these books than I could have done. For Moo!, Mike was already familiar with my dummy of the book, so he knew what action had to take place on each spread. 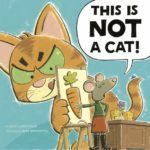 For This is Not a Cat!, I provided simple illustration notes for each scene and he took it from there. Typically, editors try to keep some distance between authors and illustrators. Was that the case here? Once the books were finalized, Mike and I spent a lot of time working together on how to promote them. Together we designed teaching guides, craft activities, games, and bookmarks. I’ve never had the luxury of working with the illustrator of one of my books so closely before. 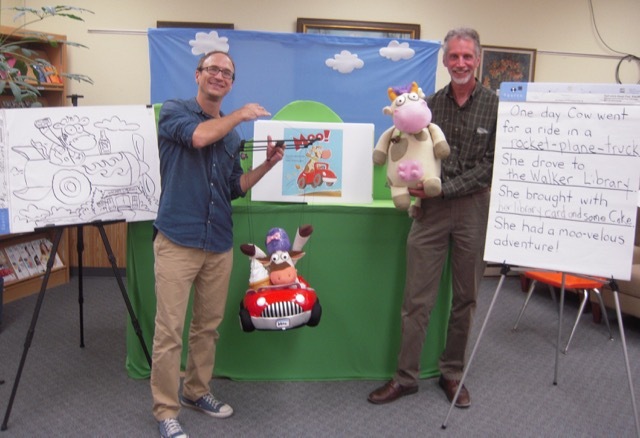 We’ve given lots of presentations together, including a puppet show tour of our book Moo! to 59 libraries throughout the state of Minnesota. It is wonderful sharing the experience of creating and promoting a book with such a good friend. It’s exciting to celebrate the successes together…and comforting to commiserate with an understanding soul during the frustrating and challenging times. Creating two books with Mike has been one of the highlights of my writing career. Your book Monster & Son also came out this year—your first written in rhyme (yes?). How did that process compare to writing in prose? The very first book I ever had published, A Christmas Guest (Carolrhoda Books 1988), was written in rhyme. One of the reviewers mentioned that the meter was a bit clunky, and for over twenty years I was afraid to write in rhyme again! When I did (Minnesota’s Hidden Alphabet, 2010), I was very careful to make sure the rhythm and rhyme were natural and smooth. This meant reading the text out loud over and over and over again, even more times than I do for the text of a picture book in prose. It also helped to have another member of my writing group read it aloud so that I could be certain it flowed naturally for other people, too. 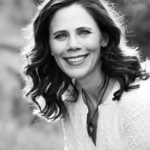 Your books show an impressive range of talents—in addition to the many picture books you’ve written and/or illustrated, you wrote Absolutely, Positively Not!, a highly acclaimed YA novel. What feeds your creativity? What depletes it? Reading great books by other authors inspires me to write good books myself. Being around creative people energizes me. My librarian friend Kim Faurot, to whom This is NOT a Cat! is dedicated, is one of the most clever and creative people that I know; whenever I attend one of her parties or puppet shows, I want to create something clever myself. Also, whenever I visit schools and kids tell me they like my books, that motivates me to go home and keep writing. I find that being on the computer drains my creativity. There’s a lot of great information on the Internet (including on your blogsite! ), and I’m often sucked into the allure of Facebook, but staring at the screen too long numbs my brain in a way that is not good for my imagination. That’s why I have to do my creative work (such as writing) early in the day before I get on the computer and start checking my email. I couldn’t agree more about the draining power of too much screen-time—and the energy boost that comes from being around creative spirits (like you!). Thanks so much for the inspiration, David. And thanks, all, for reading! To win a copy of This is NOT a Cat!, leave a comment below by November 20th. I’ll announce the randomly-selected winner in my November 29th post. Written by David LaRochelle. Illustrated by Mike Wohnoutka. David LaRochelle, Linda Ashman, Mike Wohnoutka, Moo!, Sterling Publishing, This is NOT a Cat!. Bookmark. What a great interview, and a great giveaway! Thank you for letting me enter. David is a very talented, multifaceted artist. But besides that fact, David is a good and humble man. He knows to pick good friends like Mike to complement his words! Minnesota is blessed to have them both and share them with the world. Thank you, Terri. 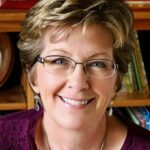 Minnesota is home to so many wonderful and kind children’s authors…like yourself. David is our local hometown-boy-done-good. In addition to being a terrific author and darned nice guy, he is a pumpkin-carver extraordinaire! He always energizes the room and people around him! Thanks, Mary! As you can imagine, it was a busy weekend of pumpkin carving for me! My latest creations for this year will be posted on my website soon! This is one book I’m looking forward to reading! I’m also intrigued by the illustrations I’m seeing in this post. Great jcollaboration. I recently read MOO of the first time. What a fun and silly book. Very interesting to learn about how it came to be! I would love to have my young granddaughter read this book with me. It is a wonderful thing to see a youngster’s ‘happy face’ when they realize they can read!! Thank you for your books! Can’t wait to pair up This Is Not a Cat with Moo! for our patrons! I enjoyed Moo! and look forward to reading This is NOT a Cat! Loved IT’S A TIGER! This looks like another great one! Love all of David’s stuff! Thanks for the post! Thanks for introducing me to a new writer/illustrator. How could I have missed him! I’ve ordered all his book and will study and enjoy them. Thanks. I just love author interviews! I love reading about the behind- the- scenes information, the collaboration between author and illustrator, and the ways different authors are inspired. Thanks to Picture Book Builders (and great authors and illustrators like David and Mike) I now have new titles to check out. I can’t wait to get my hands on them.- especially This is NOT a Cat! I’m so impressed with all of David’s books! I can’t wait to read This is NOT a Cat! I love, love, love DLR’s books…ALL of them. I am excited to read his newest. Thanks so much for this interview – fascinating insight into David and Mike’s collaboration. Happy November! I can’t wait to read This is NOT a Cat! Five words–wow! What an inspiration. That must be quite an impressive critique group, David! Congratulations on the newest book. 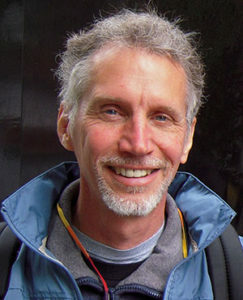 We have some very strong writers in the group, Wendy, including John Coy who writes picture books, middle grade, and YA novels. This looks like another fun book. Can’t wait to read it. Thank you for sharing. Moo! I love the way your mind works, challenging yourself to all these fun and creative ways to write a story. I just ordered a couple from Amazon, The End and 1+1=5. Looking forward to reading them to my cat. I hope your cat enjoys them, Sheryl! Great interview. Thanks for all the tips. I had so much fun reading MOO aloud to a class of preschoolers. Thanks for writing such delicious books! Both Mike and I love hearing about our books being shared with young (pre)readers, Kathy. Thank you! I shall have to go looking for this book. Thanks for sharing about it. Thank you, Linda, for introducing me to Mike & David. I look forward to reading books written and illustrated by both gentlemen. I’ve enjoyed all of David’s books. I have a signed copy of A Christmas Guest and adore his story Best Pet of All. It would be great to have a copy of his latest book. I think you got a copy of “A Christmas Guest” when it was first published, Renee…back in 1988! But you were very, very, very young then. I’ve always liked Mike better than David. When I talk to David my neck gets stiff and then I get grumpy. Although Mike is also taller than me he’s not 9’6″ and seems more down to earth. I hope this doesn’t stop me from winning as the book will go into my school’s library so all the children will have a chance to read a wonderful book. It’s a good thing you are such a good friend, Randy, or I would have to track you down at your school and step on you. And I am only 9’4″. They don’t call me “talldave” for nothing! Fabulous interview David! Cannot wait to get my copy of the book! ps I will find mine at the Booksmith in San Francisco even if I don’t win. Thank you, Katherine! And I look forward to seeing YOUR next book! And we are very lucky to have you here in Minnesota, Quinette! Sounds delightful! Can’t wait to read this book! And thanks for sharing the interesting process you had for this book! So very interesting to read how different authors/illustrators create their books! I can’t wait to get my hands on David’s books! Genius story ideas and executions. I LOVED “Moo!” I’m glad to get some insight into how that book came together (and this one as well). I love that this is so simple for beginning readers! Very cute. Thanks for sharing the interview, Linda & David! What a cute book! I love cats, so I’d love to win this one! Can’t wait for This is NOT a Cat. This looks fantastic! I love to read with my daughter.